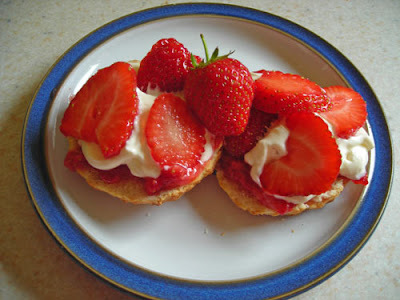 It's strawberry season and the Scottish strawberries are really sweet and delicious right now. I thought I would do something a little different with them today, so made a Strawberry Shortcake. I used a recipe from BBC Good Food but I didn't use jam, instead I crushed some strawberries with a little caster sugar, I also replaced the double cream with half fat creme fraiche which we prefer. Anyway, it was delicious! That looks so yummy ... I like your suggested variations.